to remove this cluster but I don't know how. Any help is appriciated!! Thanks. CurrentView R java.util.Vector MBean Attribute. 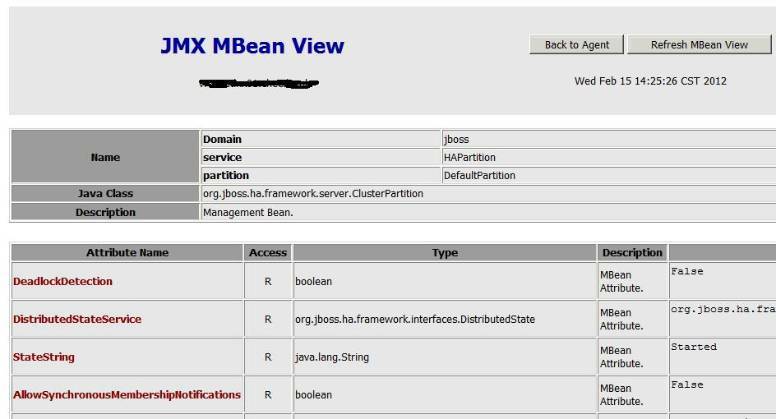 How do you start your JBoss? If I understand correct you don't want to have a cluster right? Or do you want be able to have a cluster but a unwanted member join? Is a JBoss running at IP *213? Found out that the nodename set in the /etc/sysconfig/network-scripts directory was not the same as the nodename in ther /etc/hosts. do you start or configure JBoss with the hostname or with the IP? ip address but some java components read the nodename. What I really need to know is how to clear the cluster cache. A development server is showing up as part of a cluster on the production side. The production jboss servers see the development server as part of the development cluster and we don't know how do clear the development server's ip from the cluster configuration or the cluster cache. Looks like you did not use the correct start options. See this wiki. You should use the -g <a name : default is DefaulPartition> -u <multicast address : 230.0.0.4 is default> -m <multicast port> for run.sh.